The NHS in England must get a grip on the delays patients face in being released from hospital, as the problem causes unnecessary harm and wastes money, the National Audit Office says. A report by the watchdog estimated the delays were costing £820m a year. And it warned they also put older patients at risk because they lose mobility during extended stays. It comes after delays hit record levels this winter because of a lack of support available in the community. The NAO said research shows that for every day spent in hospital an older patient can lose 5% of their muscle strength. There is also the increased risk of infection. The figures show the number of delays has risen by a third in the past two years to 1.15m days. It estimated these delays cost hospitals £820m, whereas care in the community for such patients would be about £180m. 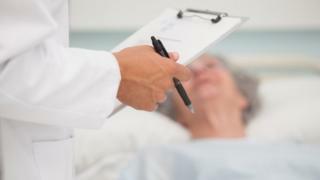 But the NAO said this was likely to be an underestimate, as the NHS only measured delays from the point patients are deemed ready for discharge - the report said they could well face delays waiting for this to be recorded or elsewhere during their stay in hospital. It said the "truer figure" could be nearer 2.7m days of delay. Waiting for nursing home places or home care were cited as the two fastest growing reasons for delays. It said workforce shortages were likely to be a major cause of this. NAO head Amyas Morse said: "There are currently far too many older people in hospitals who do not need to be there. "Without radical action, this problem will worsen and add further strain to the financial sustainability of the NHS and local government." The report found steps, such as earlier planning for discharge and the creation of specialist teams for frail older patients, were being taken to tackle the problem, but they were not yet widespread enough. Simon Bottery, of the Independent Age charity, said the problem was likely to get worse because of the ageing population. "The situation is clearly unsustainable." And Councillor Izzi Seccombe, of the Local Government Association, said: "Getting people out of hospital more quickly and back living at home will only work properly if councils get enough resource throughout the whole year to properly fund adequate provision of care services." But a Department of Health spokesman said steps were being made to tackle the issue. He said the NHS was being provided with extra funding this Parliament - the budget is increasing by 8% above inflation - while a joint pot had been established with council social care teams to encourage better joint working to help frail older people. "Elderly patients should never be stuck in hospital unnecessarily," he added. What's gone wrong with NHS finances?